Overview - A fine art auctioneer mixed up with a gang joins forces with a hypnotherapist to recover a lost painting. As boundaries between desire, reality and hypnotic suggestion begin to blur the stakes rise faster than anyone could have anticipated. "To be yourself, you need to constantly remember yourself." We are the sum of all our experiences and all our memories. They inform every decision we make, every action we take, and every facet of our personality. But what happens when some of those pieces go missing? What happens when they are manipulated or reconfigured? From Academy Award winning director Danny Boyle, 'Trance' dives headfirst into a mind-bending tapestry of fragmented identity, escalating paranoia, psychological exploitation, and hypnotic control, thrusting viewers through a contemporary noir thriller that constantly blurs the line between reality and illusion. Its twisting plot will leave one guessing until the end, and while the script's conclusion isn't as refined as it could be, the tense and disorienting ride still manages to enthrall viewers under its devious spell. After an art heist goes wrong, one of the thieves, Simon (James McAvoy), is hit on the head and forgets where he hid the multimillion dollar painting he stole. Displeased with this turn of events, his partners decide to torture him in order to find their valuable loot. But when Simon still insists that he can't remember, they resort to a decidedly unconventional method: a hypnotherapist named Elizabeth (Rosario Dawson). Hoping to discover the painting's whereabouts, Simon is repeatedly put into a trance, but as his fractured mind slowly unravels, hidden memories are unlocked and truth and illusion start to converge, revealing secret agendas that might put everyone in grave danger. Loosely based on Joe Ahearne's television film of the same name, the script, written by Ahearne and frequent Boyle collaborator John Hodge, is a constantly twisting exercise in narrative deceit. Viewers are placed in a perpetual state of questioning, left unsure exactly which characters are truly in control or what their real motivations actually are. Key moments early on, emphasized through ambiguous glances or cryptic decisions, imply that there is much more going on than first meets the eye, and slowly the story's true intentions begin to unspool layer by layer. This intentionally confusing and disorienting construction works well to keep the audience guessing, and while certain beats can get a bit convoluted (more on that later), most of these tantalizing setups reach satisfying pay offs. Placing the audience right in the mindset of the film's characters, Boyle's visuals and editing style work hard to create an appropriately hypnotic aesthetic. The director organically segues between fast-paced, quick cutting sequences and slower, meditative stretches, all while maintaining a steady rhythm. Distorted angles, skewed perspectives, and obstructed reflections all reinforce the thin line between dream and truth, and while the film's hypnosis scenes feature a faintly surreal quality, this look repeatedly invades the waking world as well (and vice versa), heightening the confusion of the narrative through cinematic trickery. As the apparent victim of all this psychological deception, James McAvoy's Simon becomes our primary point of view, and it's not exactly a reliable one. When the hypnosis therapies become more involved and other characters' deliberate schemes start to play out, Simon's mind essentially becomes a guinea pig for others to poke and prod about, loosening his grasp on sanity and his very identity. McAvoy plays this escalating loss of control and free will very well, and the actor sneaks in a certain unbridled mania behind the character's frequently unhinged smile. Though Simon could arguably be considered the film's protagonist, it's really Rosario Dawson's Elizabeth who rests at the center of the narrative, hiding uncertain ambitions beneath her soothing but potentially deceptive demeanor. Part sympathetic voice, part possible femme fatale, Elizabeth's true goals hold the key to the entire film, and Dawson takes on this pivotal role with a stellar performance. Is she trying to help Simon or hurt him? Does she really care about the painting or are there other objectives at play here? Throughout it all, the actress is able to create a cohesive character while still maintaining a level of mystery, lulling us into the script's elaborate twists and turns through soft spoken suggestion. Unfortunately, said twists and turns aren't always as tightly executed as they could be. On the surface, the third act revelations appear to hold up to scrutiny fairly well, but in retrospect some earlier behavior seems slightly out of place and the sheer onslaught of twists can be too much to swallow. Similarly, some of the surprises are a little convoluted and forced, and while I don't want to give too much away, certain reveals end up casting most of the characters in a rather unsavory light, making it more difficult to care about their fates. The climax itself also becomes a tad over-the-top and might have benefited from more restraint. As it stands, the films offers a flawed but impressive blend of genres, coming away with a unique but not altogether successful twist on classic thriller tropes. Though a stolen painting might lie at the center of the movie's plot, this is really a heist film of an entirely different kind -- that of the mind. Boyle's characters are victims of an elaborate sting operation, one where memory and identity are the items up for grab, and control is the ultimate prize. And the skilled director effectively takes audiences through a similar experience, distorting our perceptions until we are just as clueless as the frantic players on screen. 'Trance' might have its fair share of flaws, but thanks to Danny Boyle's hypnotic filmmaking, this is one thriller that even Simon isn't likely to forget. 20th Century Fox presents 'Trance' in a Blu-ray/DigitalHD UltraViolet Combo Pack. A BD-50 disc comes housed in a keepcase with a cardboard slipcover. After some skippable trailers, the screen transitions to a standard menu. The release is region A coded. The movie is provided with a 1080p/AVC MPEG-4 transfer in the 2.40:1 aspect ratio. Nicely detailed and appropriately stylistic, the transfer is strong, though there are some minor inconsistencies. Shot with a variety of professional and lower grade digital cameras, the source is mostly clean, though noise does spike a tad in a few odd shots here and there and can look just a hair static. Overall clarity is impressive, with pleasing fine textures revealed throughout the striking cinematography and production design, reinforcing the film's hypnotic mood. Going along with this, colors often adhere to a cool palette washed in light, almost pastel hues, though there are splashes of bolder tones like orange, red, and green (one hypnosis sequence set during a car ride outdoors is especially vibrant). Several sequences feature a great sense of depth as well. With that said, there are a few scenes that look comparatively flat, and some shots have a more overtly "digital" look to them that may stem from the different equipment used. Whites are bright but black levels are noticeably washed out in several darker scenes. However, in this case, the lighter blacks work with the movie's dreamy atmosphere. Though the image can be a little uneven, 'Trance' looks great on Blu-ray with a slick and stylish transfer that reinforces the film's trippy noir sensibilities. The film is presented with an English DTS-HD MA 7.1 track, an English Descriptive Audio track, a Spanish Dolby Digital 5.1 track, and a French Dolby Digital 5.1 track, along with a plethora of subtitle options including English SDH and Spanish. Oscillating between thumping music and delicate effects work, the mix is enveloping and intricately balanced, fully evoking the movie's deceptive serenity and underlining tension. Dialogue is clean and clear throughout, giving Rosario Dawson's soothing voice ample presence and priority, helping to lull the characters and audience members under her spell. The score's mixture of aggressive beats and cheery, calming melodies features crisp fidelity and engrossing separation throughout the soundstage. Effects work itself is much more subtle, but the aural design creates a convincing atmosphere through general city ambiance and specific sounds (like a creaking elevator) with smooth imaging and appropriate directionality. Dynamic range is wide and free from distortion, and bass activity is deep and aggressive throughout several music cues and during the film's more action oriented moments. Rhythmic and deliberate, the movie's sound design perfectly enhances the film's mind-bending tempo, using music and effects to bolster the visual editing. 20th Century Fox has compiled a nice collection of supplements, including a making of doc, deleted scenes, and director retrospective. All of the supplements are presented in 1080p with Dolby Digital 2.0 audio and the same subtitle options as the main feature. Deleted Scenes (HD, 17 min) – Seven deleted scenes are viewable separately or together. Unfortunately, most of these are very brief, inconsequential additions or slightly alternate takes, but an extended linear version of the MRI scene features some worthwhile material. The Power of Suggestion - Making Trance (HD, 34 min) – Presented in four parts that are viewable separately or together, this doc offers an interesting peek into the film's production. Through the usual assortment of cast and crew interviews and behind-the-scenes footage, the participants discuss the movie's script, visuals, use of hypnosis, editing process, and central female role. Danny Boyle Retrospective (HD, 15 min) – In this featurette, director Danny Boyle reflects on his entire filmography (with the exception of 'Shallow Grave' and 'Trainspotting') along with clips of the films in question. Though he only briefly touches upon each movie, he offers some worthwhile insights into their themes, production, and any lessons he learned from their completion. It would have been nice to hear from some of the other collaborators on each movie, but fans of the director should enjoy this. Short Film: Eugene by Spencer Susser (HD, 13 min) – This is a mildly amusing but completely unrelated short film directed by Spencer Susser that is included here because it was one of the winning scripts in the Intel and W Hotel sponsored "Four Stories" competition. Theatrical Trailer (HD, 1 min) – The film's trailer is included with Dolby Digital 5.1 sound. 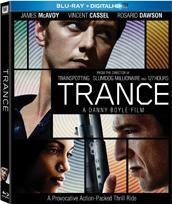 Danny Boyle's 'Trance' is a twisting psychological noir thriller fueled by deceit and manipulation. Identity and memory become precarious commodities throughout the hypnotic narrative, and while certain revelations are a little convoluted and forced, the film remains mostly satisfying. The video transfer and audio mix are both very strong, respectfully preserving the director's stylish visuals and sound design. Though not packed with the special features, the included making of doc is well worth a look. The movie isn't quite up to par with Boyle's best, but this disc still gets an easy recommendation.